“Creativity” may not be listed in Kendal at Oberlin’s mission statement, but it is certainly a major part of the framework of this life plan community. From making pottery to writing poetry, playing the piano to taking photographs, Kendal residents are regularly engaged in creative expression. Along with hands-on activities, residents have ample opportunity to attend musical performances and visit art galleries and the like, both at Kendal and in Oberlin. Research has also found that it also makes health-sense to include creative expression in retirement communities. In the Creativity and Aging study spearheaded by the late Dr. Gene Cohen, seniors who participated in intensive, participatory arts and lifelong learning programs had improved health, fewer doctor visits and less medication usage. "There is no denying the problems that accompany aging. But what has been universally denied is the potential. The ultimate expression of potential is creativity," said Dr. Gene Cohen, author of The Creative Age: Awakening Human Potential in the Second Half of Life. 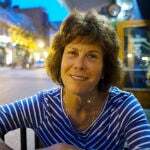 Susan Perlstein, with the National Center for Creative Aging, who worked with Dr. Cohen, said new research proves that creativity has many benefits for aging adults, including improvements in their mastery and control, social engagement and immune systems. The theme of last year’s National Center for Creative Aging conference was “Global Perspectives on Creativity and Aging.” Next Avenue contributor Heidi Raschke attended the conference and was impressed by what she learned. In a study examining the socioeconomic divide in arts participation, data scientist Linchiat Chang found dramatic health benefits for lower income older adults. Some residents sell their artwork and play music professionally. Others are novices, who now have the time and opportunity to try their hand in a variety of creative outlets. Regardless of ability, you can always find a resident at Kendal eager to share his or her knowledge and skill with others who are looking for a creative outlet. For a dozen years, Eureka! 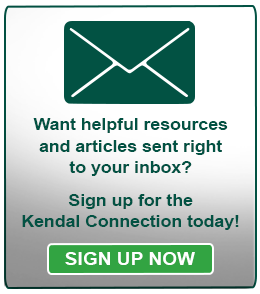 has showcased the best of Kendal poetry, fiction, humor, paintings, photography, puzzles, commentary, even music and more, from close to 200 residents. “We welcome submissions of creative work of virtually any kind by Kendal at Oberlin residents,” states the publication, which is published three times a year and distributed to all residents. Robert and the editorial staff and planning board strive to make each issue “the best.” When a resident submits an article, artwork or the like to Eureka! Robert sends a note explaining that he and at least two others will review the submission. Depending on the critique, it will either run as is, be edited and returned for approval, or rejected. “Refusing a manuscript doesn’t happen that much,” Robert says. A very different publication is Heartstrings, a quarterly newsletter put together by a handful of night staff members. The publication grew out of the night staff’s grief over losing residents and a desire to share thoughts and words of comfort with co-workers. “Heartstrings has provided the opportunity to educate regarding end-of-life care issues and quality-of-life improvements and provide motivational and emotional support,” explains Tanya Phillips, night nurse manager. One hallway in the Heiser Community Center is home to three rooms where creative energy is expressed. The Creative Arts Studio, with natural light and ample work and storage space, is designed for both serious artists and novices. Activities include watercolor painting, pencil sketching, papier mache, crayon batik and pottery. 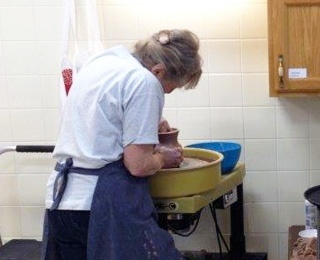 “I tell people to approach it as a child – just dive in,” says Joyce Parker, who teaches pottery. Next door is the Woodshop, stocked with an array of hand and power tools. Members (lifetime membership costs $20) build furniture and decorative boxes and repair items for other residents. They also work on building projects for Kendal, such as a gazebo, and for community nonprofits, including bluebird houses for area parks. Across from the Woodshop is the Craft Room. Weaver Mary Louise VanDyke keeps her looms there and is often found working on gifts for others. She weaves personalized cards for friends, using their favorite color and including other features, like their pet. She has also woven placemats and table runners for gifts. She recently made a gift for Marvin Krislov, outgoing president of Oberlin College. The weaving, made with red and yellow threads (the college’s colors), says “Thanks” in Chinese. Kendal resident and set designer Bob Cothran used the room to paint a three-panel mural as a gift to the community he loves. The entire project took more than four years. Now, “The Journey in Search of Curious Herbs and Spices” greets residents heading into the dining room and will do so for many years to come. Music performances abound at Kendal – from folk singer Judy Cook, pianist Helen Taylor, and other resident musicians, as well as from visiting artists from the college’s Conservatory of Music. Informally, the sounds of music are heard regularly in Heiser Lounge, the Early Learning Center and at dinner gatherings and other functions and during activities. “In general, we want to maintain a quality of life using music,” says Kendal’s music therapist, Jara Dell. Art is everywhere, too. Kendal has three galleries, which feature photography, paintings, sculptures, fiber art and other artwork made by residents and artists from the larger community. Little acts of creativity flow through the community too. The Arboretum Committee said thanks to its donors by displaying a tree, drawn by resident John Elder, and decorated with leaves made by residents in the Stephens Care Center. At the annual Scandinavian smorgasbord, organizers made name tags featuring the appropriate country flag of the resident’s ancestors. Just a mile away are lots of other opportunities for Kendal residents to experience art. Oberlin Conservatory of Music, which offers nearly 500 concerts each year, many free of charge. Oberlin College events, which include lectures, drama, dance, poetry and more. Residents can make jewelry at Bead Paradise, take a variety of art classes offered by the Firelands Association for the Visual Arts and learn how to contra dance at the Oberlin Contra Dance Club.